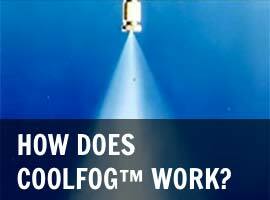 Coolfog systems pressurize water through nozzles designed to produce water droplet particles known as fog that will evaporate into the atmosphere within seconds. 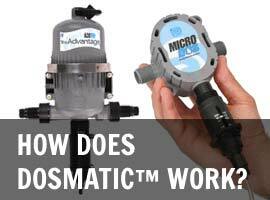 In the food industry where sanitization is required within the environment, liquid sanitizer can be injected into the suction side of the Coolfog system via a Dosmatc non-electric proportional liquid dispenser. This procedure would be applied when the rooms or storage areas are uninhabited (vacant). These sanitizers are then dispersed with the fog into the atmosphere, thereby sanitizing the surfaces of equipment and facilities and controlling any airborne microorganisms.